Some simple car door dings can be repaired with do-it-yourself methods. Most drivers end up with some parking lot damage sooner or later but it's good to know that you don't need to see a professional for every dent and ding. These simple DIY methods are good for repairing big and shallow door dents that havn't put a crease in the metal. For serious dents you need to see a professional. This is an easy method to try and there's no risk of further body damage. This method works best if the dent is about the same size as the plunger. Clean the area where the dent is with soap and water and while it is still wet press the plunger against the dent and try to pull it out. You can also apply vaseline to the dent and then try to pull it out with the plunger. For this step you need to purchase a peice of dry ice which can usually be found at a grocery or liqour store. Then use thick gloves or a towell to hold the dry ice against the car door dent. When you see frost forming over an inch outside of the dent then you can remove the ice. You need to put the dented area in direct sunlight or heat it manually with a heat gun or blow dryer and the dent should pop out slowly. In most cases your car will look 100% better. 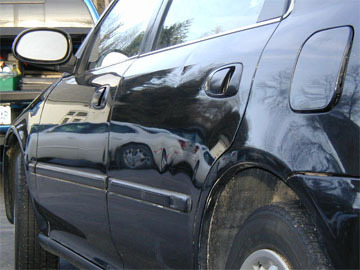 Use door protector products to prevent all of this parking damage to your doors. It's the most cost effective way to keep your car looking in prime condition.